1125, Hubcap used, 14", 86-87, BUICK, RIVIERA, 36 SLOT TYPE. 3023, HUBCAP USED, 14", 68-70, CHEVY, PASSENGER, VAN, CHROME OUTER RING, 36 SLOT TYPE, BLACK PAINTED SLOTS, DOMED CHROME CENTER, WHITE BACKGROUND WITH WORDS CHEVROLET MOTOR DIVISION, METAL CLIPS. ALSO FITS 3035. 3079, Hubcap used, 14", 76, CHEVY, NOVA, 36 SLOT TYPE. 3082, Hubcap used, 15", 77, CHEVY, PASSENGER, CHEVELLE, SLOT TYPE WITH BOWTIE INSERT, POLISHED OUTER RING, 36 SLOTS, CHEVY BOWTIE LOGO, METAL CLIPS. 3088a, Hubcap used, 14", 77, CHEVY, NOVA, 36 SLOT TYPE. 3088b, HUBCAP USED, 14", 78-79, CHEVY, NOVA, 36 SLOT TYPE, POLISHED OUTER RING, BLACK PAINTED POCKETS, BRUSHED FACE, BLACK OUTLINED, RED PRISM, CHROME BOWTIE, METAL CLIPS. 5027, Hubcap used, 14", 72-73, PONTIAC, FIREBIRD, CHROME OUTER RING, MACHINED, 36 SLOT TYPE, WITH BLACK CENTER & DELUXE FIREBIRD CREST. IN CENTER, METAL CLIPS. 597, Hubcap used, 15", 67-71, DODGE, 100, 200, 300, FORWARD CONTROL, COMPACT PICKUP, VAN, 36 SLOT TYPE. 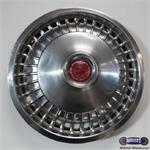 754, Hubcap used, 15", 77-79, FORD, THUNDERBIRD, POLISHED, OUTER RING, MACHINED CENTER, 36 SLOT TYPE. RAISED DOME CENTER WITH BLACK CENTER & WORD THUNDERBIRD IN CHROME, METAL CLIPS. 762, HUBCAP USED, 14", 78-83, MERCURY, ZEPHYR, MACHINED, 36 SLOT TYPE. CHROME, PAINTED BLACK SLOTS, MACHINED CENTER, NO LOGO, METAL CLIPS. 762, HUBCAP USED, 14", 78-83, MERCURY, ZEPHYR, MACHINED, 36 SLOT TYPE. CHROME WITH PAINTED BLACK SLOTS, MACHINED CENTER NO LOGO, METAL CLIPS.